Hello all, CEO Olivia here. I’ve barked out in the past about the importance of always having clean food & water bowls. Both can become a petri dish of bacteria if not cleaned regularly. That can lead to health issues. Today I want to discuss what your food & water bowls are made from. Turns out there are many that should not be on the market. First off, plastic bowls are not a good choice. Aside from the environmental impact, it turns out that plastic dog bowls can cause a dermatitis called Plastic Dish Nasal Dermatitis. It is a loss of pigment on the nose & mouth due to the chemical p-benzylhydroquinone which is in many plastics. This substance inhibits the production of melanin, a chemical that produces dark pigment in the body. Interfering with normal melanin production leaves the nose & mouth with pink blotches. So a black nosed dog might end up with a pink nose! A chemical known as Bisphenol A, or BPA is a synthetic estrogen commonly used to harden polycarbonate plastics. Research shows that even in low amounts it can cause serious health issues. The resulting harm to the body includes disruption of the endocrine system & can cause a wide variety of problems that may result in cancer, cardiovascular system damage, diabetes & impaired neurological functions. There are ceramic bowls, however I learned that pet bowls do not have to be certified as safe for food use in the same way that bowls & dishes which are intended to be used by humans are. As a result many ceramic bowls, especially those made in China, can contain lead & other harmful chemicals. So, what’s a good dog to do? My suggestion is stainless steel. That’s what Suzie Q & I use. Both plastic & ceramic bowls will get tiny grooves over time from being scrubbed & these grooves can prove an ideal spot for bacteria to grow. The same goes for bowls made from bamboo or yes, hemp. 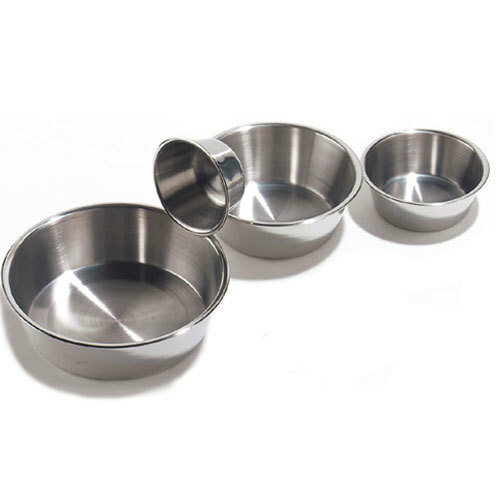 A stainless Steel bowl can be cleaned without scratching the surface & is dishwasher safe. Once you get a proper stainless steel bowl you still have to be vigilant. Our bowls get cleaned right after we eat & our water bowls are changed daily, sometimes more than once in hot weather. A few minutes of effort can mean a lot for your good dog’s health.